Friday, August 4, 8 p.m., St. Marks Lutheran Church: This coming July marks the 300th anniversary of the premiere performance of George Frideric Handel’s three Water Music suites, performed on the River Thames for the pleasure of King George I. The opening program of the Festival will feature the first and third of those suites, HWV 348 in F major and HWV 350 in G major. These two suites will then be followed by Georg Philipp Telemann’s TWV 55:C3 suite, also called Water Music, although its full title is Hamburger Ebb’ und Fluth (Hamburg’s ebb and flood). This suite honors the Elbe River by evoking a series of mythological deities: Thetis, Neptune, the Naiads, Triton, Aeolus, and Zephyr. Saturday, August 5, 8 p.m., St. Mark’s Lutheran Church: This is the Festival concert that will feature members of the Academy Faculty as performers. Entitled Orpheus in Britannia, the program will consist of a wide diversity of selections by the greatest composers of the English Baroque period. These will include Handel as well as “native” British composers, such as Henry Purcell, John Jenkins, and William Boyce, as well as many others. Sunday, August 6, 7 p.m., St. Mark’s Lutheran Church and Sunday, August 13, 2 p.m., SFCM: Every summer the Festival gives two Sunday performances of Johann Sebastian Bach’s BWV 232 setting of the complete Ordinary of the Latin Mass, best known as the “Mass in B minor.” The first of these will take place in the evening at St. Mark’s and the second in the afternoon at SFCM. Both performances will feature instrumental and vocal solos performed by Academy students. The title of the program will be Bach & Sons, and the concert will highlight works by Sebastian’s three best-known sons, Wilhelm Friedemann, Johann Christian, and Carl Philipp Emanuel. There will also be performances of the opening Sinfonia movements of several of Sebastian’s cantatas, as well as orchestral transcriptions of his music originally written for keyboard. St. Mark’s Lutheran Church is located at 1111 O’Farrell Street, just west of the intersection with Franklin Street. The address of SFCM is 50 Oak Street, which is a short walk from the Van Ness Muni Station. Prices of single tickets range between $30 and $95. The ABS Web site has a single Web page from which tickets for all concerts may be ordered individually. Tickets are accumulated in a Shopping Cart prior to payment. Those whose Shopping Cart includes all five of the above Festival productions will be entitled to a 15% subscribers discount. The options on this Web page also include tickets for the Festival Opening Night Gala Dinner. The venue will be Dobbs Ferry Restaurant at 409 Gough Street in Hayes Valley. The dinner will begin at 5 p.m. on Friday, August 4. Those attending the 8 p.m. concert will be able to show up at St. Mark’s early and be provided with arranged transportation both to and from the restaurant. Individual tickets for the dinner will be $100. 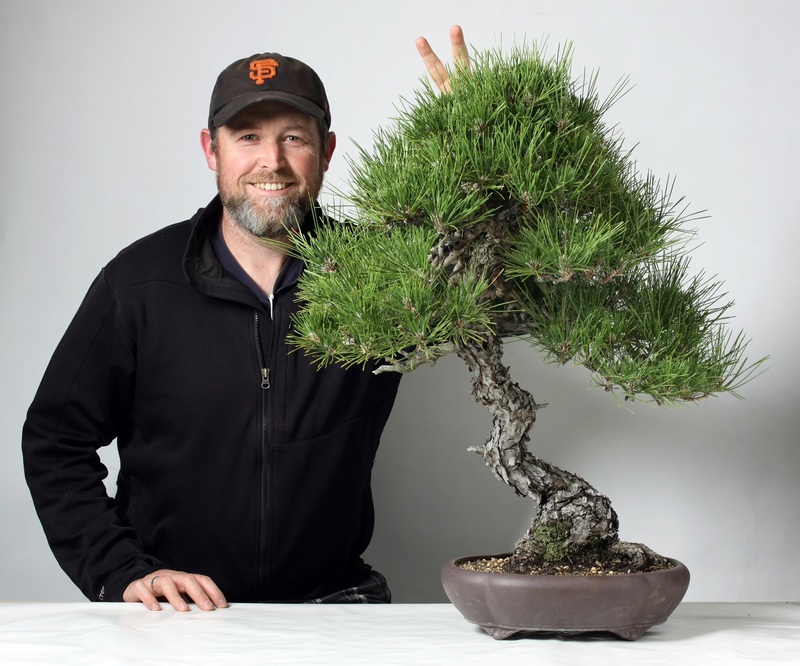 Those wishing further information about both these arrangements and the food options are invited to call ABS at 415-621-7900. There is less than two hours of chamber music included in Warner Classics’ 25-CD collection Olivier Messiaen edition. This is not so much a matter of neglect on the part of those who compiled this collection as it is a recognition of how little chamber music Messiaen wrote. Ironically, within this small division of the entire box set, one encounters of the works for which Messiaen is best known, his “Quatuor pour la fin du temps” (quartet for the end of time), an eight-movement chamber composition scored for violin, clarinet, cello, and piano. Fortunately, this is included among those first eighteen CDs of the “authorized” recordings that Messiaen himself supervised. This piece was written while Messiaen was interned at Stalag VIII-A, a prisoner-of-war camp in Görlitz in Germany (which is now the city of Zgorzelec in Poland). When transported to the camp after his capture in France, Messiaen met the clarinetist Henri Akoka. He wrote a solo for him, which would become the first sketch of his quartet. The idea of the quartet emerged after he arrived at the camp, where he met violinist Jean le Boulaire and cellist Étienne Pasquier. With his sparse resources of pencil and paper, he wrote a trio for violin, cello, and clarinet, which became his second sketch. As he continued with his work, Messiaen added himself to the ensemble; and there are two movements in which the piano accompanies the cello and the violin, respectively. The remaining four movements were written for the full quartet. Never was I listened to with such rapt attention and comprehension. However, a little bit of research reveals that this may be the most famous piece of music to be based on a mistranslation. When one consults other translations, it appears that “there should be time no longer” took some liberties with the source, suggesting that Messiaen’s French translation had the same problem of placing the dramatically poetic above fidelity to the text. In the Revised Standard Version, the phrase is translated as “there should be no more delay;” and the Jerusalem Bible translates it as “the time of waiting is over.” In other words the time has come for all of those apocalyptic visions to be fulfilled. Nevertheless, the fact that the visions that Messiaen translated to music are based on a misreading of Scripture does not make them any the less visionary. On that same Wikipedia page one can read descriptions of each of the movements, through which one can enjoy how those visions were translated into music. Once again, there are the expected references to birdsong, including those in that very first clarinet solo that Messiaen wrote for Akoka. There are also some extraordinary unison passages for the entire ensemble associated with the trumpets that announce the Apocalypse. In other words all eight movements are delivered with both clarity and expressiveness in this collection, all under Messiaen’s supervision. The pianist was, of course, Messiaen’s wife, Yvonne Loriod. The other parts were taken by violinist Christoph Poppen, clarinetist Wolfgang Meyer, and cellist Manuel Fischer-Dieskau. 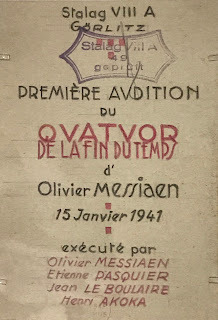 Furthermore, one of the movements involves a reference to an unpublished composition that is also included among the recordings that Messiaen supervised. That unpublished piece is “Fête des belles eaux,” written to accompany a display of fountains (“belles eaux”) at the 1937 Paris Exposition. The eight movements of this piece depict alternations between rockets (“fusées”) and the patterns of the water (“L’eau”) in the fountains, concluding with a burst of fireworks in the eighth movement. One more thing: Messiaen’s score was written for six ondes Martenot, the electronic instrument invented in 1928 by Maurice Martenot. The music that Messiaen wrote for the duet for cello and piano in “Quatuor pour la fin du temps” drew upon his representation of the waters in “Fête des belles eaux.” Thus, not only does this collection provide the attentive listener with more exposure to the ondes Martenot than (s)he could have anticipated; but also it discloses one of the sources behind Messiaen’s quartet. Note, also, that the recording of “Fête de belles eaux,” made in 1961, was a performance by a sextet led by one of the foremost authorities on the ondes Martenot, Messiaen’s sister-in-law, Jeanne Loriod. 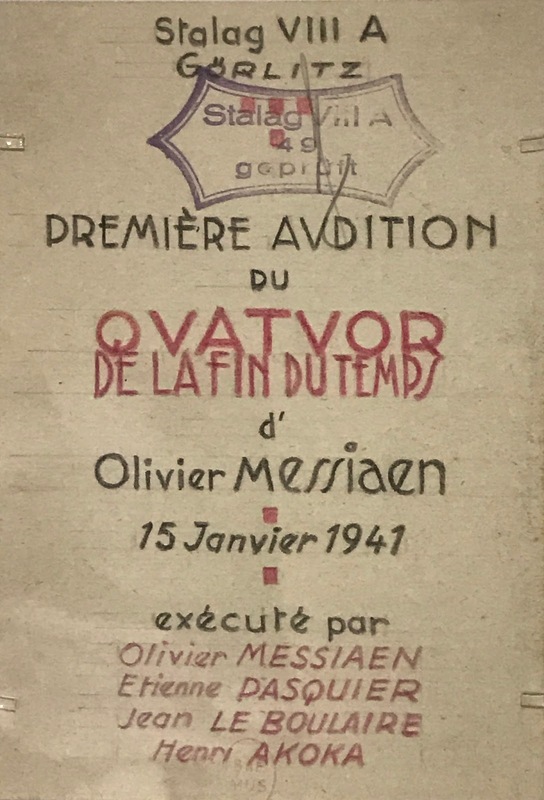 The only other Messiaen-supervised recording is of his 1932 set of variations on a theme for violin and piano, recorded by Poppen and Yvonne Loriod at the same session at which “Quatuor pour la fin du temps” was recorded. Among the “landmark” interpretations, there are only two selections. These include “La mort du nombre” (the death of numbers), another very early composition that dates from the same time as his organ “Diptyque,” and “Le Merle noir,” a depiction of blackbird song for flute (Emmanuel Pahud) and piano (Éric le Sage). These are relatively modest offerings, but they contribute to fleshing out a general idea of Messiaen’s limited approach to chamber music. The latest release on harmonia mundi of the Akademie für Alte Musik Berlin ensemble will be out this coming Friday. This is a group that has provided me with abundant hours of enjoyable listening experiences, many of which have been translated into my own meagre writing skills to the best of my abilities. Those familiar with how impressive an ensemble this is are likely to want to take advantage of the usual opportunity to pre-order through Amazon.com; and, for those who have not yet heard the group, pre-order may prove just as advantageous. The album consists entirely of music by Georg Philipp Telemann collected under the general title Concerti per molti stromenti, given a somewhat vernacular translation in the title of this article. Those who have not seen the Telemann-Werke-Verzeichnis (Telemann works catalog, abbreviated TWV) are probably not aware of how much larger it is than the catalog of the music of Johann Sebastian Bach. The first volume (TWV 1), which consists only of the sacred cantatas, has 1860 entries; and the total number of volumes is 55, along with an appendix volume. The concertos are distributed across four volumes. TWV 51 has 23 concertos for solo instrument and orchestra. The 28 concertos for two instruments and orchestra are collected in TWV 52, and the seventeen for three instruments are in TWV 53. Those involving more solo instruments are in TWV 54, which has only nine entries. Most of the selections on this new recording are from TWV 53 and TWV 54. However, there are also “concertos” from TWV 44, the volume of chamber music involving four or more instruments with basso continuo. This album is more interested in imaginative combinations of instruments than it is in which pieces have been categorized where. 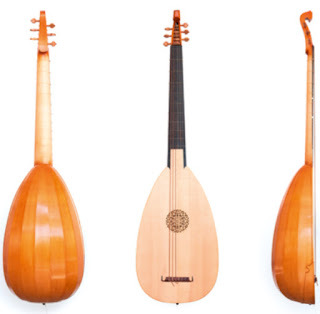 The number of strings (courses) can vary; but Telemann included tuning specific for a six-course instrument. It was used as a continuo instrument, but only to play the bass line, rather than any realizations of figured bass chords. In TWV 53:h1 (B minor) concerto, it is one of the solo instruments; and it contributes to the continuo in the TWV 44:43 concerto in B-flat major. As might be guessed, one of the TWV 54 concertos (the first selection on the album) involves three trumpets (Ute Hartwich, Martin Patscheider, and Christian Gruber) and timpani (Francisco Manuel Anguas Rodriguez); and it definitely makes for a dazzling beginning. The most unique of the TWV 53 concertos is the one with solo parts for mandolin (Anna Torge), hammered dulcimer (Elisabeth Seitz), and harp (Margret Köll). No leader is specified for any of the concertos. Presumably, each concerto is led from the concertmaster’s chair, occupied by Georg Kallweit in all performances. 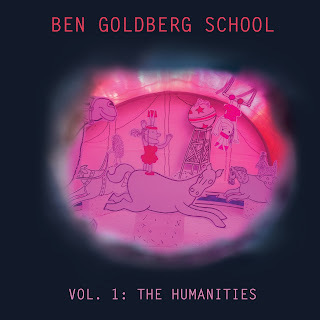 Listening to this album took me back to my student days of listening to DeKoven Presents on the radio. Seymour DeKoven, who insisted on being called only DeKoven (“please skip the Sir or Mister”), restricted his broadcasting repertoire to music from the baroque and rococo periods, which he would call “barococo.” In all likelihood, his enthusiasm considerably outweighed his scholarship; but, because he relied heavily on Musical Heritage Society recordings, his selections tended to be period-faithful with impressive consistency. His enthusiasm was best expressed by his evaluative terms for high quality. One could not tune in without hearing at least one recording described as OTW (for “out of this world”); and usually there would be at least one “Super OTW” recording included each week. His Wikipedia page also includes OTG (out of this galaxy), OTU (out of this universe), and OTC (out of this cosmos). Personally, I do not recall his using any of these; but they were definitely stock-in-trade among my fellow students at the Massachusetts Institute of Technology, where he had a major fan base. He would definitely have called Concerti per molti stromenti a Super OTW album, and probably would have given it an even higher rating. Thursday, June 1, 8 p.m., Luggage Store Gallery (LSG): The two sets in this week’s LSG Creative Music Series will involve primarily free improvisation with electronic gear. The first set will be taken by Dania Luck performing “Person L,” the result of her project based on programming in the Supercollider language. She will be followed by John Davis, who works with both electronics and acoustic instruments, which usually have been prepared in one way or another. The Luggage Store Gallery is at 1007 Market Street, directly across from the Golden Gate Theatre at the corner of Golden Gate Avenue and Taylor Street. As always admission will be on a sliding scale between $6 and $15. Friday, June 2, 7:30 p.m., Center for New Music (C4NM): Pianist Anne Rainwater will give a solo recital entitled A Woman’s Place is at the Piano. The program consists of compositions written by and for women. The composers to be performed will include Annie Gosfield, Caroline Ansink, Luigi Dallapiccola, and Jude Traxler. C4NM is located at 55 Taylor Street, half a block north of the Golden Gate Theatre, where Golden Gate Avenue meets Market Street. General admission will be $18 with a $15 rate for C4NM members. Sunday, June 4, 2 p.m., C4NM: Adam Marks will curate a visit from So Much Hot Air. This is a duo in which mezzo Jennifer Beattie is accompanied by Zach Pulse on both oboe and cor anglais. They perform music written for them by composers including Juraj Kojs, Jason Charney, and Diana Wade. General admission will be $15 with a $10 rate for C4NM members. Sunday, June 4, 7:30 p.m., The Musicians Union Hall: The next SIMM (Static Illusion Methodical Madness) Series concert from Outsound Presents will follow the usual two-set format. The first set will be taken by Ghost In The House, a diverse ensemble whose members are Karen Stackpole (gongs), David Michalak (lap steel guitar), Tom Nunn (invented instruments), Kyle Bruckmann (oboe and cor anglais), John Ingle (saxophones), Dean Santomieri (resonator guitar and vocals), and Polly Moller (bass flute). As has been relatively consistently the case, the second set will be taken by Noertker’s Moxie, led by Bill Noertker on bass, along with Annelise Zamula on tenor saxophone and flute, Max Shrieve-Don on bass clarinet, and Jason Levis on drums. The Musicians Union Hall is located at 116 9th Street, near the corner of Mission Street. Admission is on a sliding scale between $10 and $15. Ironically, the notes for the program book overlooked the local significance of this piece. Harrison composed it in 1986 for percussionist William Winant, pianist Julie Steinberg, and violinist David Abel, all members of the San Francisco Contemporary Music Players (SFCMP) at the time (although the piece was given its premiere performance on February 18, 1987 in Hertz Hall on the campus of the University of California at Berkeley). During this season in which May 14 was Harrison’s 100th birthday, Winant has supervised several different performances of “Varied Trio,” one of which was included in SFCMP’s Lou Harrison: A Centenary Celebration festival last month. I should thus begin with the personal observation that this was the first time I experienced a performance of “Varied Trio” in which Winant was not involved! The percussion part, which required three different stations, each outfitted with different arrays of percussion instruments, was taken by SFS Principal Percussion Jacob Nissly. He was joined by violinist Melissa Kleinbart and Eric Zivian, pianist with the Left Coast Chamber Ensemble. 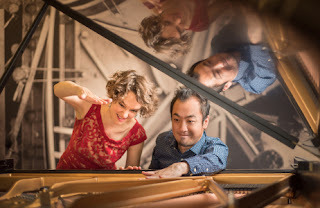 The “varied” quality of the music involves styles that alternate among Oriental references, eighteenth-century dances, and an elegy involving rich twentieth-century chromaticism. There is also considerable variation in the use of resources. That elegy is a violin solo accompanied by a few vibraphone strokes at the very beginning and the very end and an equally small number of arpeggiations from the piano in the middle. The movement provides the “still center” of the entire composition with a delicious sense of serenity. On the other hand, the “Bowl Bells” movement that precedes it (requiring tuned rice bowls played with chopsticks) is punctuated by only a few pizzicato gestures on the violin while Zivian struck his instrument with a small wooden mallet. There was no doubt that the performers made this their own characteristic interpretation, demonstrating that Harrison’s music can maintain its freshness through the “varied” skills of different performing groups. A similar contrast of vigor and quiet introspection could be found in Francis Poulenc’s sextet, which he composed in 1931 and revised in 1939. He scored this for piano (Robin Sutherland) and wind quintet, played this afternoon by Tim Day (flute), Eugene Izotov (oboe), Jerome Simas (clarinet), Rob Weir (bassoon), and Bruce Roberts (horn). Here, again, the “still center” can be found in the middle movement, although its own center is a bit of rambunctious playfulness framed by the quietude of the outer sections. Similarly, the unabashed romping of the first movement encloses a quiet middle section, whose thematic content then returns at the conclusion of the entire composition. The SFS performers could not have negotiated all of these mood swings any better than they did this afternoon (although Roberts did let one horn outburst at the beginning of the final movement get the better of him). They were certainly not shy when it came to any of those rambunctious qualities, but they also captured the genuinely introspective qualities of the quieter portions. “Genuinely” is definitely the right adverb here. Between 1931 and 1939 Poulenc was subjected to a tragic experience that led to his taking a more serious approach to religious faith; and, by his own account, the 1939 version involved a major reworking of the original. This afternoon’s performance thus summoned up a sense of expressiveness that was consistent with Poulenc’s own life experiences. Light without the shadows could be found in Eugene Goosens’ Opus 41, a pairing of two movements, the first called “Pastorale” and the second “Arlequinade.” Goosens scored these movements for flute (Day), oboe (Izotov), and piano (Day’s son, Britton Day). Goosens was born in London, the son of a Belgian violinist and conductor. Opus 41 was composed in 1924 and reflects an interest in the pastoral that can be found in other British composers during the first half of the twentieth century. Particularly interesting was the composer’s command of the wind parts, dealing with the two instruments both separately and in several intriguing blends. (Goossens brother Leon was an oboist.) This afternoon marked the first SFS performance of this piece, and we have every reason to hope that it will not be the last. The only weakness of the afternoon came with the opening selection. This was Samuel Barber’s Opus 11 string quartet in B minor, composed in 1936. Barber would subsequently repurpose the middle movement of this three-movement composition, scoring it for string ensemble and calling the result “Adagio for Strings.” However, there is a transparency in the original version through which one can better appreciate the nuanced manner in which thematic material seamlessly shifts from one instrument to another. I also have to say that, when all four parts ascend to their respective upper registers for the climax, a skilled string quartet is less likely than a string orchestra to sound like a bunch of yowling cats. This afternoon’s quartet of violinists Yun Chu and Amy Hiraga, violist Nancy Ellis, and cellist Peter Wyrick definitely had the necessary skills. That climax could not have been more moving in its intensity. However, just as intense is the agitation that the listener encounters in the outer movements, energetic gestures that Barber deployed with some fascinating alternations between parallel octaves and rich harmonies. The four SFS string players never mustered the energy required through which that intensity could deliver the necessary blows to the attentive listener. For all the understanding that had gone into the middle movement, the surrounding framework came across as little more than a matter-of-fact reading. Fortunately, things picked up considerably for the remainder of the program, leaving any problems with the Barber as a distant memory. Thursday, August 3, 7:30 p.m. and Saturday August 5, 2 p.m.: The second full-length program will be Gioachino Rossini’s two-act opera La Cenerentola (Cinderella). All performances will take place in the Concert Hall of the San Francisco Conservatory of Music, located at 50 Oak Street, a short walk from the Van Ness Muni station. Ticket prices will be $70 and $50. Tickets are being sold by the Box Office in the outer lobby of the War Memorial Opera House at 301 Van Ness Avenue, on the northwest corner of Grove Street. The Box Office may also be reached by telephoning 415-864-3330. The Box Office is open from 10 a.m. to 5 p.m. on Monday and from 10 a.m. to 6 p.m., Tuesday through Friday. Tickets for all four performances are also available online. Each of the programs has its own event page on the San Francisco Opera Web site, and the hyperlinks to those Web pages are given according to the specific dates above. Each of those event pages then has separate hyperlinks for purchasing tickets for the evening and matinee performances. We generally associate the cantatas of Johann Sebastian Bach with the last quarter-century of his life spent in Leipzig as Thomaskantor at the Thomasschule associated with the St. Thomas Church. The Thomasschule provided music for all four Lutheran churches in Leipzig; and, during Bach’s tenure, the cantatas he composed constituted a major portion of that music. Nevertheless, Bach was composing cantatas earlier in his career; and a new album from harmonia mundi focuses in his time in Weimar between 1708 and 1717, when he served first as organist and then, in 1714, as Konzertmeister (director of music) at the court of Ernest Augustus I, Duke of Saxe-Weimar. The album is entitled simply Cantatas for soprano, and the featured soprano is Carolyn Sampson. She sings with the Freiburger Barockorchester under the direction of Petra Müllejans, and the music combines the secular with the sacred. The opening selection is BWV 202, Weichet nur, betrübte Schatten (which I like to translate as “chill out now, bummer shadows”), which is usually known as the “Wedding” cantata. The two sacred cantatas are BWV 152, Tritt auf die Glaubensbahn (tread the path of faith), and BWV 199, Mein Herze schwimmt in Blut (my heart swims in blood). BWV 152 has solos and a duet for for soprano and bass-baritone; and Sampson is joined by Andreas Wolf for this performance. Ernest Augustus I was profligate enough to bring about the financial ruin of his duchy; and, as might be expected, his tastes ran to worldly pleasures. There is thus a good chance that religious services were held in relatively modest settings. This may explain why these three cantatas are basically chamber music compositions. There are no choruses; and the strings would have been significantly reduced, if not played one-to-a-part. As a result there is a prevailing rhetoric of intimacy in the two sacred cantatas, as well BWV 202, which may well have been performed at a wedding ceremony with only a limited number of guests. Sampson has built her reputation primarily on the early music repertoire. However, her opera résumé includes the role of Adina in Gaetano Donizetti’s L’elisir d’amore; and her last recital in my home town of San Francisco was based on her 2015 album Fleurs (flowers), almost all of whose selections came from the nineteenth or twentieth centuries. (Even the song by Henry Purcell was performed with figured bass realization by Benjamin Britten.) However, whatever the “temporal vintage” of the music she sings, the clarity of her voice is endowed with a light touch that well suits that aforementioned rhetoric of intimacy. The result is an album of Bach at his most personable. We tend not to associate that adjective with him, particularly when we read books that apotheosize him to a place “in the castle of heaven.” Of course we know from the accounts of his jamming at Gottfried Zimmermann’s coffee house in Leipzig that Bach had a worldly side; and, given the worldliness of Ernest Augustus’ court, it is no surprise that the music on this album tends not to wallow in tedious solemnity, even with a title as serious as that of BWV 199. This is the music of a Bach that was perfectly happy to be on earth with family and friends; and both Sampson and Müllejans offer the attentive listener just the right down-to-earth approach to this music. Last night in the Concert Hall of the San Francisco Conservatory of Music, Opera Parallèle presented the first of four performances of the “dance-opera spectacle” completion of Philip Glass’ triptych of theater pieces based on the works of writer and film director Jean Cocteau. “Les Enfants Terribles,” performed in a single act without intermission, is based on a novel of the same name, whose first English edition was published under the title The Holy Terrors and which was then made into a film that Cocteau directed in collaboration with Jean-Pierre Melville. The original conception of this operatic treatment was developed by Glass working with choreographer Susan Marshall. The idea was that the key characters would be represented by both dancers and singers, who would appear on the stage simultaneously. The novel’s account of “terrible children,” whose perverse behavior unfolds as disturbingly provocative, would have been quite a blow to readers when the book first appeared in 1929; and the 1950 film had its own techniques of getting under the viewer’s skin. Last night’s staging was conceived by Opera Parallèle’s Creative Director Brian Staufenbiel, working with choreographer Amy Seiwert and media designer David Murakami. Considering the outrageousness of both the text and cinematic source material, the result was disconcertingly bland; and the realization of the narrative was more muddled than provocative. Admittedly, what was over-the-top to Cocteau would probably come across as benign, if not ordinary, to current audiences; but it is also possible that Staufenbiel and his team never quite managed to home in on what made this particular Cocteau creation so disturbing. The bottom line is that the underlying narrative ended up being buried under media excess, beginning with a snowfall projected on three screens that seemed to go on forever before the first notes of Glass’ score were performed. While the performances of the four vocalists, Rachel Schutz, Hadleigh Adams, Andres Ramirez, and Kindra Scharich, were clear and expressive to their best of their abilities, the choreography, danced by Steffi Cheong and Brett Conway, tended to be frenetic and self-indulgent. Any sense of dramatic tension resided in the intensity of Glass’ score for three pianos, given as powerful a performance as one could hope for through the efforts of Kevin Korth, Keisuke Nakagoshi, and Eva-Maria Zimmermann (the latter two being the members of the ZOFO Duet) under the disciplined and well-moderated baton of Nicole Paiement. Last night in Davies Symphony Hall, the San Francisco Symphony (SFS) presented a long-overdue premiere. Dmitri Shostakovich’s suite of eleven settings of the verses of Michelangelo received its first performance. This was the first half of the program prepared by Manfred Honeck, currently Music Director of the Pittsburgh Symphony Orchestra, also appearing on the SFS podium for the first time. The vocalist, on the other hand, has been a frequent visitor to San Francisco, German baritone Matthias Goerne. Shostakovich began work on this suite in the summer of 1974, which turned out to be almost exactly twelve months prior to his death on August 9, 1975. It was originally written for bass and piano (Opus 145, completed on July 31) and was first performed in that form on December 23, 1974. Having finished the piano version, he turned his attention to an orchestrated version (Opus 145a), which he completed on November 5. However, he never heard his music in that form, since it was not performed that way until October 12, 1975. Shostakovich’s encounter with Michelangelo’s poetry seems to have been only through a Russian translation by Abram Efros. All but two of the poems that Michelangelo selected are sonnets, and the last is probably the opening octave of a sonnet. It is unclear whether Efros tried to capture either the rhythm or the rhyme scheme of the Petrarchan form, and it is probably not relevant. Shostakovich was occupied solely with the semantics of these poems; and the vocal delivery has a strong prose-like character. What probably drew Shostakovich to his selections was the variety of ways in which this working artist used his writing to reflect on the nature of life, the commitment to work, and the world in which both of these were embedded. The accompaniment then provides both context and commentary with respect to those significations that Shostakovich chose to prioritize. Here we encounter much that is familiar, particularly when the commentary is ironic. We also encounter the composer often working with very spare resources in individual songs, allowing different sections of the ensemble for provide different colorations for the texts as appropriate. One of those colorations was a delicious solo taken by Principal Bass Scott Pingel, which was almost as lyrical as the vocal line (if not more so). Nevertheless, there are the occasional full-throated outbursts from the ensemble, almost as if Shostakovich wished to make sure that listeners knew that he still “had it.” The most striking (pun intended) of these comes in the “Creativity” poem, in which a super-charged percussion section delivers its own rendition of Michelangelo attacking his block of marble with hammer and chisel. The entire cycle was given a disciplined interpretation by Honeck that was as expressive as it was attentive. His chemistry with Goerne was definitely a good one, allow Goerne the full scope of his own expressive toolbox to endow each poem with its own individual character traits. Honeck’s relation with SFS also seemed to be equally effective. Opus 145a offers a variety of challenges in “resource management;” and these challenges can only be overcome through “noise-free communication” between the podium and the ensemble. Honeck was definitely clear about where he wanted this music to go, and SFS seemed to be totally committed to following him there. The second half of the program was devoted entirely to Pyotr Ilyich Tchaikovsky’s Opus 64 (fifth) symphony in E minor. Honeck thus chose to introduce himself to San Francisco with an all-Russian program, combining the rarely-performed with a familiar warhorse. His approach to Opus 64 began with some particularly imaginative shaping of dynamic contours, and he definitely knew how to evoke quiet passages with maximum intensity. However, as the symphony progressed, it was clear that his preferences lay with the other end of the dynamic spectrum. The result was some truly rousing fortissimo passages that definitely got the juices flowing on audience side. Nevertheless, there is only so much that one can take before recognizing a sameness to all of those gestures. As Pierre Boulez would have put it, Honeck never recognized the need for “lesser peaks,” without which the performance never manages to establish the one climax to rule them all. By the time the final movement lumbered its way into the coda, the attentive listener could have been forgiven for asking how much more of this stuff remained before the final measure. Nevertheless, that final measure was followed by an enthusiastic audience response, suggesting that Honeck had successfully tapped into an interpretation of Tchaikovsky with powerful mass appeal. Regular readers probably know by now that the British Chandos label has released three volumes in a project by Andrew Davis and the Melbourne Symphony Orchestra to record the orchestral works of Charles Ives. They may also know (not from this site, however) that a project to record the orchestral works of Aaron Copland with John Wilson conducting the BBC Philharmonic has thus far advanced to its second volume. It would appear that someone at Chandos has gotten hooked on twentieth-century music from the United States, perhaps with a preference for foot-stomping thigh-slapping Americanisms. That reputation was earned in 1935 with the performance of his “Ballet Mécanique” at the Museum of Modern Art in New York. Antheil wrote this piece as accompaniment for a silent film of the same name created by Fernand Léger and Dudley Murphy, who worked with Man Ray as their cinematographer. The film was basically a Dadaist abstract study of mechanisms in motion, and Léger and Murphy may well have assumed the viewers would easily supply sounds of their own in their heads. Anyone who had done this would not, in any way, have been prepared for what Antheil came up with; and it takes only reviewing his instrumentation requirements to see why: sixteen synchronized player pianos, two grand pianos, electronically controlled bells, xylophones, bass drums, a siren, and three airplane propellers! Antheil also has a significant non-musical reputation. During the Second World War he developed a technique known as frequency hopping that would prevent enemy “wiretapping” of radio signals being transmitted to guide torpedoes. The coding of those signals involved the use of punched paper tape, so the idea probably was the result of that interest in player pianos. Particularly interesting, however, is that Antheil had a partner in developing this invention and filing the patent for it, Hollywood film star Hedy Lamarr. There is nothing particularly “bad boy” about the music included on the first Chandos release. Basically, all three of the selections on the album are joyously raucous, even more extroverted than anything by Copland and entirely lacking in any of the metaphysical brooding that permeates Ives’ New England transcendental rhetoric. 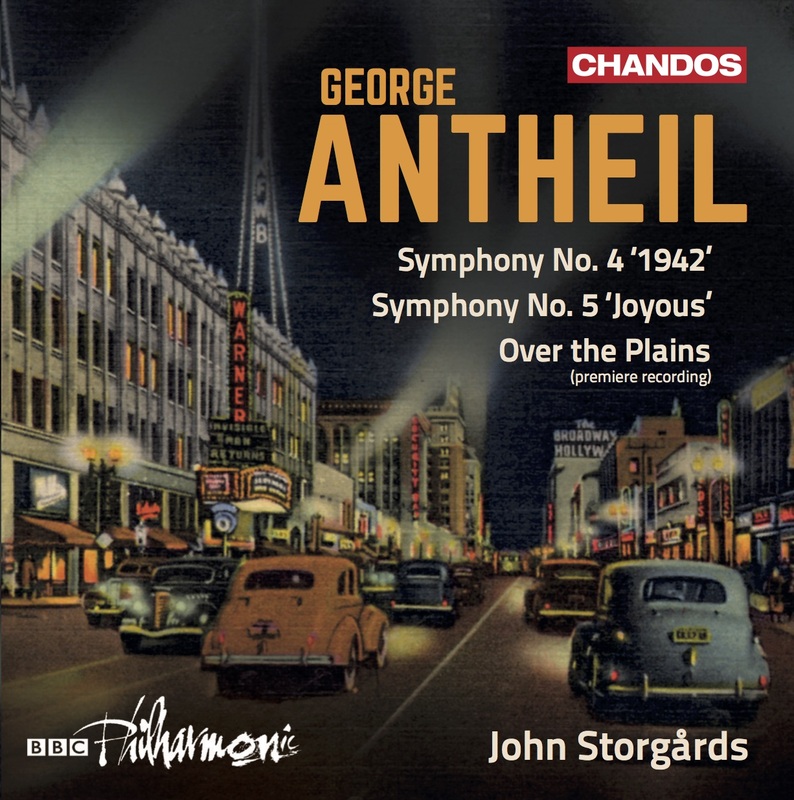 Indeed, the title for Antheil’s fifth symphony, the third selection on the album, is “Joyous;” and since it was begun in 1947, the joy probably has to do with the end of the Second World War and the defeat of Adolf Hitler. This is music that makes Copland sound positively stodgy, and its energy level seems to have mined the same sources that both Sergei Prokofiev and Dmitri Shostakovich had tapped when the War ended. The other symphony on this album is the fifth symphony’s predecessor. The fourth was composed in 1942, meaning that the ideas probably began to emerge after the bombing of Pearl Harbor. The music has very much a call-to-arms rhetoric; and some of Antheil’s contemporaries were quick to point out the “family resemblance” with Shostakovich’s Opus 60 (“Leningrad”) symphony in C major, which was premiered in North America on July 19, 1942. In this case, however, Antheil pushed back, asserting that his primary source for this symphony was an opera he had composed in 1930. The album begins with the premiere recording of “Over the Plains,” which can probably be described as a concert overture. It certainly takes the cake when it comes to revving up the audience for whatever may follow on a concert program. The primary theme sounds like a mash-up of “Red River Valley” and “Columbia, the Gem of the Ocean.” Given how little attention Ives had received by 1945, the year in which “Over the Plains” was composed, it is entirely possible that Antheil was unfamiliar with the trappings of “Ives country.” More likely, Antheil may have been wondering if he could use his friendship with Lamarr to get known by John Ford, the uncrowned king of the Western movie genre, so taken with the wide open spaces of Monument Valley that he had a house built there. My guess is that there will be many quick to dismiss all three of these selections as pure corn. To them I would say, “Give it a rest, and let yourself have some fun for a change.” This music may not be profound, but it eschews both the rhetorical darkness of composers like Prokofiev and Shostakovich and the tub-thumping patriotic fervor of Copland. 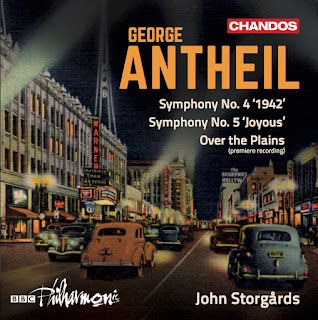 The best way to enjoy Antheil is to lower your guard and let his music get to you on its own terms. June 17, 7:30 p.m.: The featured artist will be violinist Lucian Kano Balmer. Those celebrating the 50th anniversary of the Summer of Love may recall (if they remember anything, as the old joke about the Sixties goes) that 1967 was the year in which Angel (the American label for EMI classical recordings) released the first volume of West Meets East, which brought violinist Yehudi Menuhin together with Indian sitar master Ravi Shankar. Menuhin basically “sat in” on a session in which Shankar played his interpretations of traditional Indian ragas as well as original compositions. He led a group that also consisted on Alla Rakha on tabla and Prodyot Sen on tambura. Menuhin both improvised and played from his own transcriptions of Shankar performances. July 29, 7:30 p.m.: Vocalist Gautam Tejas Ganeshan will present a program of Carnatic music. He usually performs as part of a chamber ensemble. However, no additional performers have yet been announced, nor has any specific information about the selections he will be presenting. All performances will take place at the Episcopal Church of the Incarnation, located at 1750 29th Avenue, about halfway between Moraga Street and Noriega Street. Ticket prices are $20 for general admission with a $15 rate for students and seniors. Because the demand tends to be high, advance purchase is highly advised. Tickets may be purchased online through Eventbrite. Subscriptions are not being sold, but each of the hyperlinks on the above dates leads to the event page for single ticket purchases. Further information may be obtained by calling 415-564-2324. 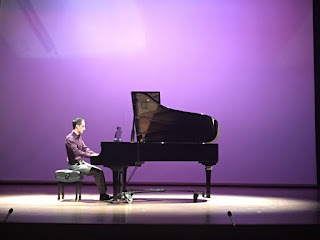 Last night the Caroline H. Hume Concert Hall of the San Francisco Conservatory of Music hosted the third visit to the Bay Area by the Seattle-based musicians of Music of Remembrance (MOR). MOR’s motto, which is part of its logo, is “ensuring that the voices of musical witness be heard.” The objects of witness are the many instances of man’s inhumanity to man, with special attention given to the Holocaust. In addition to giving concert performances, MOR releases recordings, presents educational programs, and commissions new works. Last night’s program, entitled Mirror of Memory, presented the results of two of those commissions. The second half was dominated by the Bay Area premiere of “to open myself, to scream” by Mary Kouyoumdjian, following up on its world premiere in Seattle this past Sunday. The commissioned work on the first half of the program was “The Seed of Dream,” composed by Lori Laitman in 2004. Both halves of the program also examined the legacy of Yiddish song. In the first half mezzo Catherine Cook sang six of these songs, all of which had originated in the Vilna Ghetto, arranged by Jaroslavas Cechanovicus for accompaniment by two violins (Mikhail Shmidt and Artur Girsky), viola (Susan Gulkis Assadi), cello (Walter Gray), and bass (Jonathan Green). The second half concluded with six Yiddish songs and dances arranged for string quartet and clarinet (Laura DeLuca) by Betty Olivero, created in 1997 as incidental music for a screening of the silent film The Golem: How He Came into the World, created by Carl Boese and Paul Wegener. Finally, the evening opened with one of the compositions to come out of the Theresienstadt concentration camp, Hans Krása’s “Tanec,” a dance movement scored for string trio (with Shmidt taking the violin part). In terms of both composition and execution, Krása’s trio turned out to be the most satisfying offering of the evening. The score had just the right undercurrent level of irony to reflect the composer’s tenuous state. Theresienstadt was a transfer camp, a “holding venue” for those who would be sent for extermination at Treblinka and Auschwitz. Krása died at Auschwitz, whose other victims from Theresienstadt included Viktor Ullmann and Pavel Haas, the year after he composed “Tanec.” Shmidt, Assadi, and Gray gave this music an attentive and expressive reading. Each performer had a clear sense of how to blend with his/her colleagues, making this the most satisfying account of a chamber music ensemble, rather than the work of a gathering of individual players. At the other extreme was “to open myself, to scream,” conceived as a reflection on the story of Romani artist Ceija Stojka, who managed to survive three concentration camps and lived to the healthy age of 79, dying in Vienna in 2013. 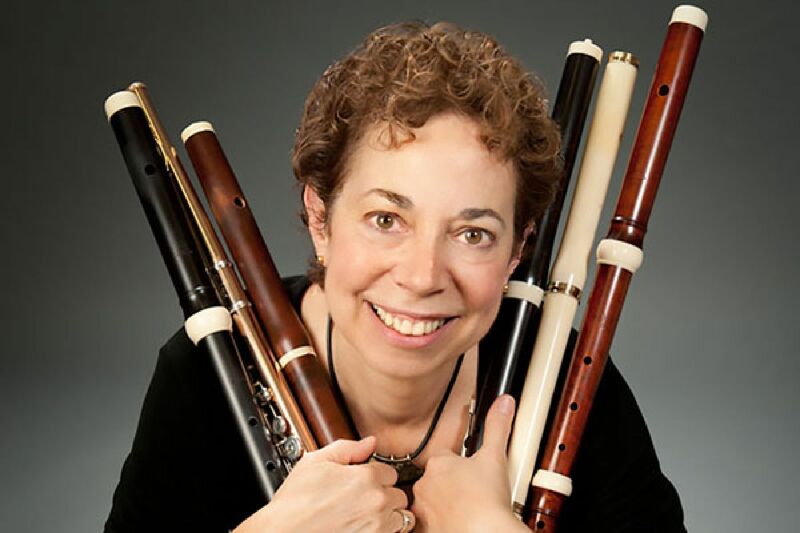 Kouyoumdjian scored the piece for a small chamber ensemble playing against an electronic track of sampled passages supplied by each of the members along with Kouyoumdjian’s voice. It is structured in four uninterrupted movements; but there was little sense of connection to the titles of those movements (each of which was inspired by one of Stojka’s paintings) in last night’s reading of the score. Instead, the dominance of DeLuca’s clarinet work made it almost impossible for the informed listener to avoid thinking about Olivier Messiaen’s “Quatuor pour la fin du temps” (quartet for the end of time), while the overwhelming presence of the electronic samples suggests that Messiaen’s quartet is being run over by one of Steve Reich’s “Different Trains.” If that were not enough, Kouyoumdjian’s score was played against the projection of a visual design by Kevork Mourad in which images (which may or may not have have been based on Stojka’s art) were subjected to real-time warping, overlays, and dissolves that turned out to make for a thoroughly aggressive assault on the listener’s sense of vision. “Scream” was definitely the operative verb in the conception of this composition; but the scream turned out to be inordinately sustained and only weakly modulated, almost as if the only objective of the composer was to convey Stojka’s personal pain. However, if Kouyoumdjian’s reflection of Stojka was hard to take, at least it was not as overloaded with clichéd gestures as was “The Seed of Dream,” a setting of five poems by Abraham Sutzkever written in the Vilna Ghetto. Laitman set English translations of these poems (with no mention of the translator in the program book); and Cook did her best to endow the weaknesses of the score with expressive signification. Nevertheless, there was the disquieting sense that, while there was much for Sutzkever’s poems to say, even in translation, Laitman was using them only as syllables on which to hang her notes. Still, listening to Cook sing in English was far more satisfying than her approach to the Vilna Ghetto songs in Yiddish. Here in San Francisco we have the good fortune to be able to listen to someone like Sharon Bernstein, Cantor of Congregation Sha’ar Zahav, who has not only a solid command of Yiddish but also the necessary discursive (as opposed to operatic) approach to delivery. By failing to grasp the subtle changes in vowel sounds that differentiated Yiddish from German, Cook made these songs sound like some weirdly arcane corner of the German lieder repertoire; and the result did no favors to either the music or Cook’s skills in the performance of art song. 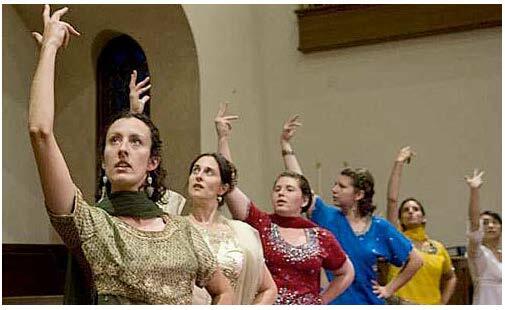 In contrast Olivero’s instrumental approaches to songs and dances were more consistent to the spirit of Yiddishkeit, and they concluded the evening with a gentle reminder that brevity is still the soul of wit. The musical side of the program will be Caroline Shaw’s 2011 string quartet “Entr’acte.” This composition seems to have one of the more unique inspirations. It involves not another quartet from the chamber music literature, but the specific performance of that quartet by the Brentano Quartet. The music they were playing was Joseph Haydn’s Hoboken III/82 quartet (the second of his Opus 77 quartet); and, in her own words, Shaw was taken by “their spare and soulful shift to the D-flat major trio in the minuet.” She neglects to say on the Web page for this piece that the minuet itself is in F major, meaning that Haydn’s modulation was about as radical as one could get. However, she does say that her own piece “is structured like a minuet and trio.” My past two encounters with this piece have found it enigmatic (even where that preposition “like” is concerned), leaving me wondering just how much explanation would be required to resolve those enigmas. This performance at C4NM will begin at 7 p.m. on Thursday, June 15. It will be preceded by a reception with the artists at 6:30 p.m. C4NM is located at 55 Taylor Street, about half a block north of where Golden Gave Avenue meets Market Street. General admission will be $20 with a $15 rate for C4NM members. Both levels of tickets may be purchased in advance online through a Vendini event page. Modest Mussorgsky is not remembered for very much of his music. Opera lovers know him for Boris Godunov but also for their arguments of which version most suitable for performance. The Fantasia crowd knows him for “Night on Bald Mountain,” not realizing that they are listening to Nicolai Rimsky-Korsakov’s efforts to “repair” the composer’s “mistakes.” However, the reflex reaction to Mussorgsky’s name is almost always “Pictures at an Exhibition.” However, similar to the case of “Night on Bald Mountain,” just about everyone who reacts that way immediately thinks of the orchestral version by Maurice Ravel. Those who follow piano recitals know better, but there is a good chance that most of them know little about anything else that Mussorgsky wrote anything else for that instrument. Last Friday the Italian DYNAMIC label released a recording of pianist Giacomo Scinardo playing Mussorgsky’s complete piano works. This fills only two CDs, but it accounts for pretty much the entire span of the composer’s creative life. The very first piece he composed, at the age of twelve, was a piano piece entitled “Porte-enseigne Polka,” which he then published after publishing it at his father’s expense. At the other end of his life, in 1880, Mussorgsky prepared piano arrangements of two of the instrumental interludes for The Fair at Sorochyntsi, an opera he never managed to complete before his death the following year. There is thus considerable breadth in the repertoire that Scinardo has recorded. Nevertheless, those wishing to pick nits about thoroughness may not be satisfied. In the Complete Works Edition edited by Pavel Lamm (whose piano repertoire is available thanks to Dover Publications), we see that several of his pieces went through two versions. In those cases Scinardo has chosen to record only one of them, and that should be enough to satisfy most listeners. While it is true that, during the last quarter of this piece one gets the impression that, if Mussorgsky had been working things out at the keyboard, he must have had three hands, a disciplined approach to executing this complexity is far from out of the question. The good news is that Scinardo prioritizes such a disciplined approach under the assumption that the expressiveness will take care of itself. As the old joke goes, “He does, and it does.” This is a performance realized with the attentive listener in mind; and, even with the limitations of recording technology, such a listener is likely to encounter some gems in the details that (s)he may not have previously imagined. If Scinardo has been that successful in his fidelity to “Pictures,” then we should have no trouble crediting him with bringing the necessary understanding to all of the other works in this collection.